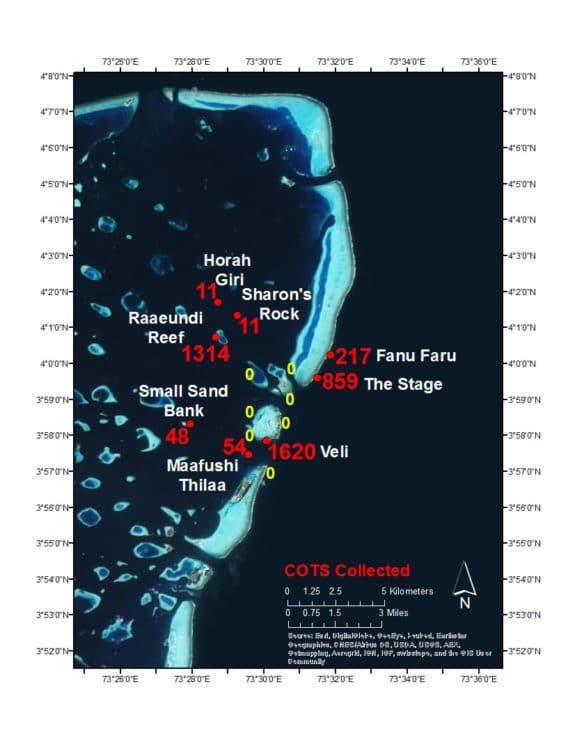 Our third area of research in the Maldives involved recent outbreaks of COTS reported from South Malé Atoll near Anantara Dhigu and Veli. Marine Biologists Marta Rigo and Alba had first observed starfish in the fall, primarily on Stage Reef, an outer reef north of the resort. Prior to our arrival, they mobilized teams on two occasions, collecting over 200 animals. 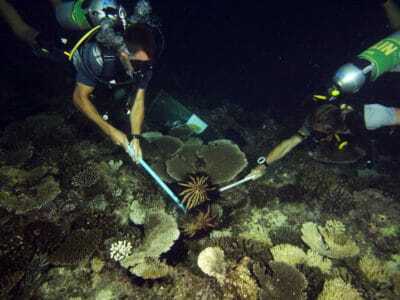 Teamwork on Anantara’s coral reefs. We began our surveys and collection efforts on smaller patch reefs within the lagoon, but identified only minimal damage and small numbers of COTS. On the second day, we began work on Stage Reef and areas to the north, near Fanu Faru. We identified a pattern of damage similar to what we saw in other locations. The starfish had advanced from the north, and were spreading southward. Much of Fanu Faru was already a graveyard of skeletons, with living cover rarely exceeding 2-3%. However, as we searched the shallows on the reef flat and the reef slope further to the south, the amount of live coral increased. Sadly, the amount of recently killed corals (which appeared as white lesions) also increased and the numbers of starfish increased. Over two days we thoroughly searched this reef system, from 1-2 m depth to 25 m, removing over 1,000 starfish from the epicenter of the outbreak. Fortunately, the southern end of Stage Reef, closer to Anantara, had no visible signs of damage and no COTS. The resorts’ Dive Masters recommended that we next check a patch reef (Raaeundi Reef) located within the lagoon, as they had seen numerous starfish in shallow water. This was quite a large reef system with a beautiful Acropora-dominated reef crest and slope and a mixed community with massive, plating and branching corals on the deeper part of the slope. Evidence of COTS was widespread. We found hundreds of white feeding scars, and dense aggregations of animals. In several deeper areas, densities exceeded 100 animals in a 5 square meter area of reef. After several days of SCUBA surveys, we successfully removed COTS from the outer perimeter. 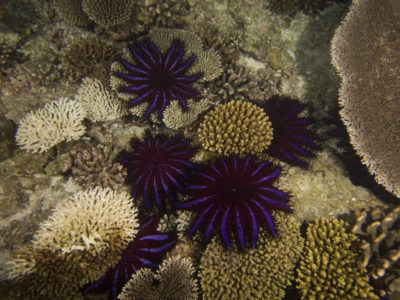 Just before leaving, I snorkeled into the center of this patch reef to examine the top of the reef. 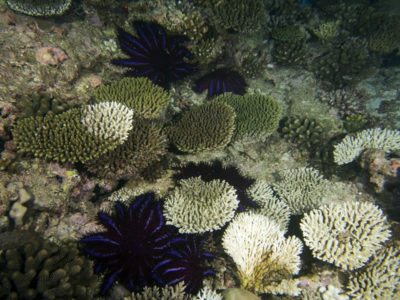 Unexpectedly, the shallows (1-2 m deep) supported a dense coral community consisting of branching acroporids, smaller boulder corals, and other species, many of which were under attack by starfish. We scoured the area to capture every remaining starfish, removing in total more than 1300 animals from this reef. 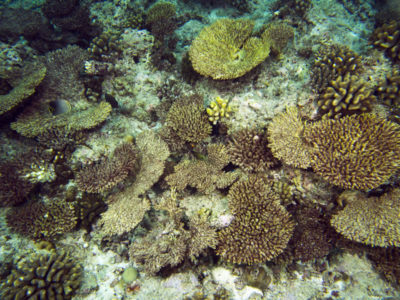 Anantara corals killed by COTS; dead for a few weeks. Because the starfish appear to have initially invaded the outer reefs to the north of Fanu Faru and were spreading south along the fore reef, and we found such a high density of COTS several km to the east, within the lagoon at Raaeundi Reef, I predicted that other patch reefs between Raaeundi and Stage would also be infested with COTS. Much to our surprise, all other reefs in the vicinity were free of COTS and there was no sign of COTS feeding scars. On our second to last day we completed tow board surveys around the entire perimeter of Anantara, to ensure none of the neighboring house reefs were being affected by COTS. After several hours of searching, as it began to get dark and we were just about to head in for the night, we encountered starfish at the southeastern end of Anantara, near Veli Reef. This was a beautiful reef system with very high cover of table acroporids and other branching corals, so this finding was alarming. Delaying our departure for another day, we dedicated two full days to the removal of COTS on Veli Reef. In total we collected 1620 COTS from a very small section of this reef. 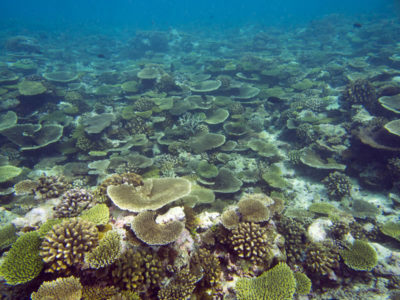 Fortunately, the damage to corals was concentrated in an area that was less than 400 square meters and all of the coral on either side was in excellent health. Anantara was the perfect case study to evaluate the ability to effectively conserve coral reefs through the mitigation of COTS. We responded to the COTS outbreak within a very short time after the first documented infestation, and were able to remove the majority of the starfish from all of the affected reefs. Extensive surveys in other surrounding sites were undertaken to verify that other populations did not exist. In addition, the high level of concern, interest and involvement by resort staff and marine biologists enhanced our ability to combat this threat. The volunteers that assisted us learned a lot about the ecology of the starfish, how to safely remove them, and the importance of future monitoring and control efforts. We finished up our stay in Anantara with a great sense of success. We managed to mitigate the largest threat currently affecting these reefs, and leave behind a team of ocean stewards that can carry the conservation efforts into the future, securing the survival of these precious resources.